Spent the last two days just sorting all my scraps....tons of scraps. I am trying to keep with Stacey's colour-controlled method of doing string quilts, so I sorted all my scraps into colour piles to make it easier to grab strips. I am using "scraps". - less than fat quarters but nothing less than 2 in squares. I am saving these for crumb quilts. I have two bins of these. 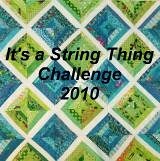 My plan for 2010 is to use up all these scraps and make string quilts or crumb quilts. Let's see how this turns out!! I havent made a block yet. I cant decide what colour combo I want to use. I wont dwell on this too long. I am leaning towards blues, greens and purples.